In the two months I have been writing this blog I have been interested to see what prompts readers to send comments and emails. One that surprised me was the gentle chide that churches shut down administratively in the summer then wonder why people stop coming to worship. But all of those who gave me an “amen” on this one agreed that it won’t change anytime soon. So instead of fighting it, I offer a compromise. 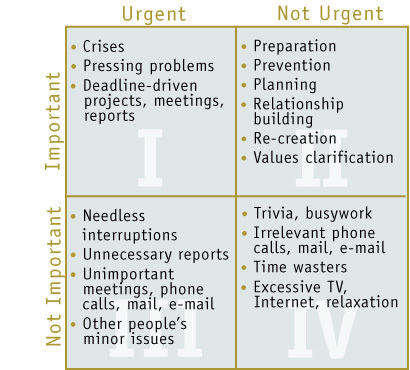 Using Stephen R. Covey’s teachings, spend some time this summer with your c hurch leaders in Quadrant 2, the important/not urgent area. This is where planning, visioning and evaluation take place. With other committees on hiatus this may be the perfect time to get your church leaders to take a step back and see where you are. Rather than focusing on this month’s work of their committees they can take a larger view, a Quadrant 2 view. Find a quiet patio, make some lemonade and have a thoughtful, strategic session. Dust off your strategic plan (you DO have a strategic plan don’t you?) and see how it’s coming. If you haven’t done much with it in the last 2 1/2 years there’s a good chance it’s a bit out of date. Does it need to be trashed and a new one begun or does it need to be tweaked? How are your projections in terms of programming, worship attendance and finances? What balls have been dropped and need to get going again? In addition to your work with the strategic plan, do the same with your endowment. An endowment/planned giving program is the epitome of Quadrant II work. Before Labor Day you and your leaders should review your endowment policy to make sure it is doing the work it should be. And while you’re at it get a planned giving seminar on the calendar for the fall. We at the Foundation can help with both of these. Church committees tend to get into a rhythm. At the September meeting they do Task A, and in October they do Task B, all from the Important/Urgent quadrant (and surely at least a bit in the Not Important row as well). Spending some time this summer will help to get out of the rhythm/rut and make sure you are going the right direction. And once your key church leaders have done this for a summer, encourage every single committee, task force and board in your church to schedule one meeting every summer where they can only work on Quadrant 2 stuff. I have no doubt that you will have significant resistance at first. But I am equally sure that you will find the urgent work during the school year to be more productive if you have taken the time to get ready and aim before you fire. ← The Kingdom or the Castle?